I have purchased Creator NTX2 and NTX3 and both have the same problems in the same area. I am trying to use Creator NTX3 at this time. When I go to make a movie that I want to render to a DVD is when I have the problems. I am tying to make a DVD movie of down loaded from UTube. When I am a making the movie I want to add a transition and make it longer in time. It will not go longer than one second. This goes for any other feature that says it can extend time. When I go to burn the DVD I fill out all the needed information on the page prior to clicking on the burn button. It renders the movies then when it goes to render the menus it starts and then freezes. I am getting frustrated with the program It is good but has a lot of problems. Please let me know what I can do to solve the issues??? Please explain with some detail exactly what your are doing? Where are you adding the transition? What format is the downloaded video? How long in time is it? What do you mean by "extend time"? In order to have a Transition, there must be something before it and something behind it. Transitions only work when there is something there at both ends. 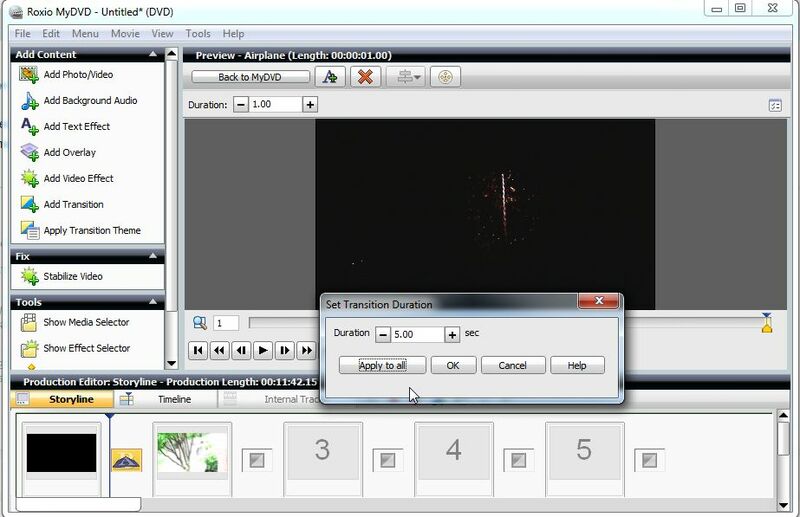 If I add a second clip, I can change the time of the transition! If I don't have a 2nd clip, I can add a color panel to make the transition work. Posting pic info is HERE. In regards to the extended play issue I think I see now how to make them work better so that I can extend the time. Now for the biggest problem and that is burning the movie to DVD. By the way I can us a different program to burn the same videos to a DVD and I have no problem. I downloaded a Utube video that are in a MP4 format. These videos are musical in type and are 5 minutes in length. 1. Open Burn Video DVD in MyDVD. and select DVE format with menus. 3. Add Text to the title area. 4. Add one movie the I add the other movie. 5. Add transition in between the two movie clips. 9. It opens project, Encodes the movies, it goes to encode menus and the percent bar goes to 91 percent and then stops any and all movement after that. 9B. If I get an error message at this point it will be "Not Responding"
10. At this point I have left it for hours and it will not go any further. 11. That is all the steps that I have used and no matter what I do it will always hang at the same percent. You said " select DVE format with menus." What is a DVE? Have you tried playing the DVD enough though the program hangs? How much time are you trying to put on the DVD (DVE)? The formate DVE was a typo it should have been DVD. As or playing the program through in the preview area when I click on the first movie and it goes to load the menu it stops after what looks to be about 90%. When I click on the second movie the menu loads. When I check the validation of the project it says no problems. As for total time I am adding only 10 minutes of movie time to be bund to the DVD. NOW give me an answer to the faulty software called Creator NTX3. I did not ask about playing the project through the preview area. Did you burn a disc or an ISO file? Play either one of those using the free VLC player. Does it play correctly? If you haven't, burn the ISO (image) file and play that with VLC. OK , lose the attitude if you want help from the users like us; if not, contact Roxio support and pay for the privilege. We have nothign to do with designing the program nor did we have a hand in the installation on your computer. 1)Where do you find the validation step? 2) Please provide this information (that you haven't yet given us). Unfortunately there are some things that you are saying that don;t seem to conform to what is expected from MyDVD. I don't quite follow your setup. Is each of the two movies a separate menu item on the main menu? If yes then where are you adding a transition between the two movies (your step #5)? What happens if you leave out the transition? What text are you adding and where? Forget about validation - it will not tell you anything. I will try and furnish an answer to the questions for skins. His name is Sknis. Hope this corrects the below reply The validation step is found under the tool tab. Can I burn an ISO file. That is no. It stops when encoding the menus. I have used the VLC viewer on the two video music files that I down loaded from Utube that are in MP3 format and each one works OK. As for the DxDial file it is attached to my first post. In regards to Mygriggi with question 4 I have attached two files made by using psr program to record each step that was used each time. The first file I make as a new file from the two movies that were down loaded from Utube. There is and over lay error that I corrected by moving the text on the main menu screen to separate them and this did away with of overlay error message. Then I try and burn the ISO fill but it will not encode the menus and stops responding and stop working. The second file I use a previous file and try to burn an ISO file but it also does not encode the menus. 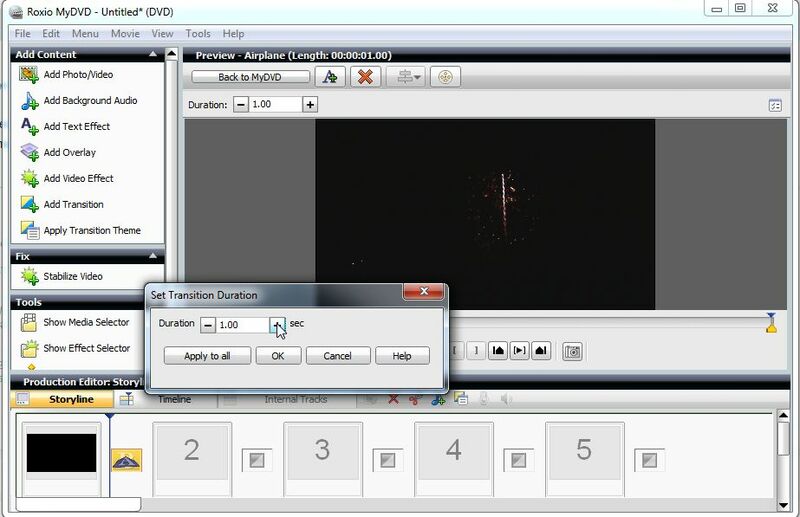 I have never been able to burn any DVD project when it comes to making Video DVD. I can make a DATA DVD or CD. I am trying to make a video DVD from music videos down loaded from Utube in MP3 format Each movie is 5 minutes in length. When the program tries to encode the menus it stops and after about one or two minutes there is an error message saying :Not responding." Then when I close the process there is an error message of : Video Wave Not Responding". Wen I us the same two down loaded videos in a program called PowerDirctor I have no problems in burning a Video DVD. When I play each down loaded video using VLC viewer they both play all the way through. I hope the two attached files help giving you step by step of what I did. To read the file that are in a zip file click on the file and it is read as an HTML file that is read in the Internet Explorer. I just tried to make a ISO file using the same two movies added seperatly and without change the default menu style and not adding and chapters or transitions and it burned the file all the way through. That is about all that I can say. No one named skins here. See my correction on the name from Skins to sknis. How about a simple test. Start a New DVD Project. Take the defaults don't touch anything! Add a still picture or 2. Burn to Folder or ISO. I have been doing some testing on burning the DVD and ISO file and have been able to burn both. When I leave out the change menu audio and do all the steps I can burn without any problems. I had previous stated that the music was in MP3 format. This is wrong they are in .wmp format. This leaves me with one question. Is there a format for the music to be added to the change menu audio that will work so that it can be encoded into the menus when the encoding is done when burning to a DVD or ISO file. 1. When I do not change the menu style and add the two movies one by one and do not added any transitions or color panels or text nor do I change the menu audio then I can burn a ISO file it burns the file with out any problems. After burning the ISO file I changed the same to burn to a DVD and it burned without any errors. 2.When I changed the menu style, added no chapters or transitions, no change in menu audio It burns without any problem. 3. When I change the menu style, do not change menu audio, add transitions and change transitions times. added a scrolling text into a colored panel added at the end of the last movie and add chapters the DVD is burned without any problems . 4. All of the above steps where made by using the same two MP3 movies that were downloaded from Utube. We are all most home now. If the question of what format the music can be in if a person wants to change the menu audio so the project will burn to either a DVD or ISO file. I got the idea to experiment when asked what happens if the transitions are left out. What are wmp files? Or did you mean wmv files? NXT 3 has no problems with wmv files or with mp3 files. It is very poor practice to try to do a whole project in one session. I always do a few steps and create an intermediate iso file and play that. It is a lot easier to debug any problems then with the whole project where you made a lot of changes many of which may/did cause your problems. I tried to look through your "step by step" listing which is almost impossible to use. You seemed to a fooled around a lot with the menu structure which probably caused all your problems. Take Jim's advice and initially just use the defaults. Then you can slowly make your mods. To answer the last post on where are the transitions added they area at the end of each clip. 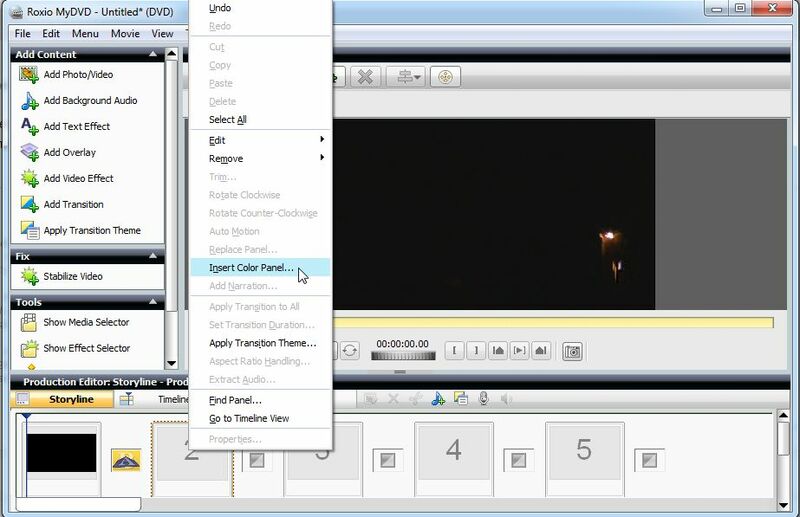 I right click on the name of the movie and click on edit movie then click on Storyline this area puts the move into different clips with the transition part in between each clip. This is where I can set the transition time by doing a right click on the transition clip area. I can also add a colored panel to a clip area following the movie clip and then add a text transition to the colored panel. To do this I used the color of white for the panel and you can use either red or black for the text color. Now to answer my own question on the changing of the Menu Audio to a different music. I can now to this by using the Edit Audio part of the program. I save the cut down version of the music I want to use and save it to a file and use. .wmp format. Then go back to the project that I am working on and import that song. The whole idea I have learned is to cut the song down to 3 or 5 seconds of the song and it will not interfere with making the DVD or the ISO file. So as it looks to me that this case is closed on my part as the parts that were not working are now working. I have to correct the file format that I saved the music to and that change is to the .wav format. Thank you for putting up with me. I did learn some how to do tips when it came to adding the transitions. Also the tip of trying one step at time. I have never heard of wmp audio files. You also should not have to convert mp3 files to wav as the program does that anyway. NXT 3 accepts mp3 files. To answer the last post on the wmp format this was a typo on my part it should have been .wma format. When I separated the song clip from the video in a different program I had to convert that file by using Format Factor to change the format. I choose .wma format as this will play when making Audio CDs to play in my pickup. I choose to use .wav format as that was one of the formats that I could us when I saved the cut down version of the song when using the Audio / Music part of NTX3 when saving it to a file. Hope this answers and or corrects the typo information.